Be Dream Hostel Barcelona: have fun at your hostel next to the beach! Travelers of the world, get ready!! 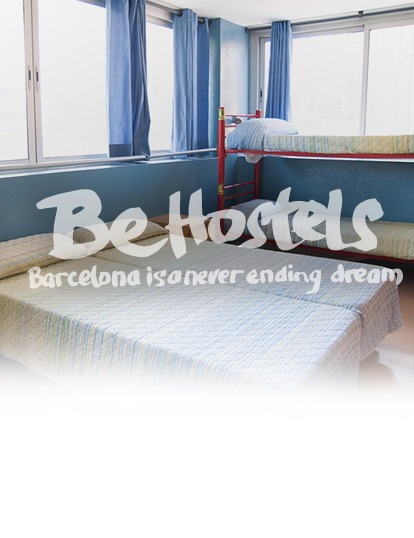 Be Hostels offers you a place to enjoy all of Barcelona plus a location right next to the beach. This is the place to come to if you want to relax, make friends, be creative and/or discover greater Barcelona and it’s center, only 15 minutes away on the Metro system. You can find all these free facilities at Be Dream Hostel to enjoy your stay in Barcelona! Be Dream hostel just 5 minutes walking from the beach, away from the stress of Barcelona! Our hostel was a primary school we have completely reformed and made into a truly unique hostel. Our hostel has a big open dining room, a large kitchen and many common rooms with sofas for chilling out. Our dorms are mixed with 2-12 beds with wifi, personal lockers for each traveller, < All our rooms have big windows and let the Barcelona sunshine in!! For us, the most important thing is that our travelers see and begin to understand what “Barcelona” means and represents to the people who live here. Our staff is always ready to give you a “locals perspective” on where to go and what to see. Barcelona is a metropolitan city like no other. People come from all over the world to see Gaudi’s buildings, abstract and beautiful, Picasso’s artwork, or to enjoy the beaches and Mediterranean Culture. But we want you to see more! We want you to feel the Barcelona vibe.Do you want to dream? Barcelona is a never ending dream!!! Come to catch your dreams with us at Be Dream Hostel!